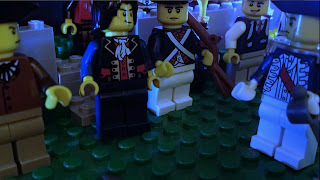 The video featured in the previous blog post (see at http://www.defendingthelegacy.blogspot.com/2015/12/beyond-mask-30-seconds-with-lego.html) is one that my siblings and I created for a contest run by Beyond the Mask. Because the winner is the video with the most views, please watch and, if you liked it, tell your friends about it. My part in this video was co-writing the script, constructing most of the sets, character design, and all the editing. Many of the Lego bricks seen in this movie are from my collection. My voice was used for Charles Kemp (the villain). My sister co-wrote the script with me, set up scenes and lighting, and was assistant camerawoman. She also worked on character design. Her voice was used for Charlotte Holloway (the heroine). My brother set up the scenes and lighting, was chief cameraman and director of photography. He helped with character design (Will's appearance was entirely his work) as well as some set construction and supervising all stunts and stuntmen. His voice was used for William Reynolds (the hero). Will Reynolds (center with hair) is framed by Mr. Harrison (far left). George Washington is at the far right. My dad's voice was used for Mr. Harrison ("He did it") as well as Benjamin Franklin ("Follow the wires"). My mom took over our normal chores so that we could have more time to film. She also allowed us to use her closet as a studio and her phone as a movie camera. This movie was filmed on an iPhone 4s and edited with Windows Live Movie Maker. Lines were recorded with Audacity.